Brick is one of those design elements that people either love or hate. Well over half of the questions that come to me have to do with brick: How do we work with the brick? How do we pick a siding that goes with the brick? What about roof color and brick? Can I paint my brick? How can I possibly live with this brick? Here is a photo of an early-last-century, Tudor-style home with the signature brick gabled entry and chimney. The brick is monochromatic (not a lot of contrast between individual bricks), and it is a very pleasant dark muted red color. The new homeowners chose an olive green siding color which complements the brick and makes it stand out as a feature on the house. (That works great if you like the brick! I’ll address what to do if you hate your brick in another post.) The muted olive siding color balances the muted red of the brick so that the house elements are in harmony (a fancy way of saying “They just work!”). Even though the windows themselves are white, the homeowner chose cream for the trim color. Cream is much softer than white and is preferable to white on older homes or with earthy palettes. And see? You can use cream trim with white windows and not ruin the house. As for the roof, obviously this is a new roof and the homeowners took advantage of the myriad choices available to them. The muted brown tones pick up on some of the browns in the brick and again pull a very visible element of this house — the roof — successfully into the palette. Traditional wrought iron sconces and mailbox as well as period hardware on a solid wood door provide the perfect jewelry topped off by a real, not plastic, concrete urn on the front steps for summer flowers. These homeowners took an old home and modernized it in a tasteful way that pays homage to the home’s original Tudor styling. The result is both fresh and historic. Perfect house synergy. I have a customer with a large red brick tudor in Massachusetts, a round top brown front door, beige/brown/cream roof tiles, wronght iron balconies/hand rails and is looking to put wood shutters on. They are concerned with appropriate color. Currently they have a brick red color louvered shutter and are consider black or brown. Can you offer some input? I was going to suggest black shutters with a new door color, maybe brighter red? As long as they have wrought iron balconies/hand rails, the black shutters should work fine. I would keep the round top brown door. That’s a classic look. I would find a pattern — floral or geometric — that has lots of colors in it: greens, reds, pinks, purples… lots of color. That will keep your house from looking too Christmasy. Otherwise… if you love the hunter green/dark red combo, then find some dark red pillows. They will look striking with hunter green and against the white. Embrace the combo. Can you tell me the exact color of this paint and who makes it? I can’t, but have a look at Benjamin Moore’s Sea Haze 2137-50. See if that works for your project. 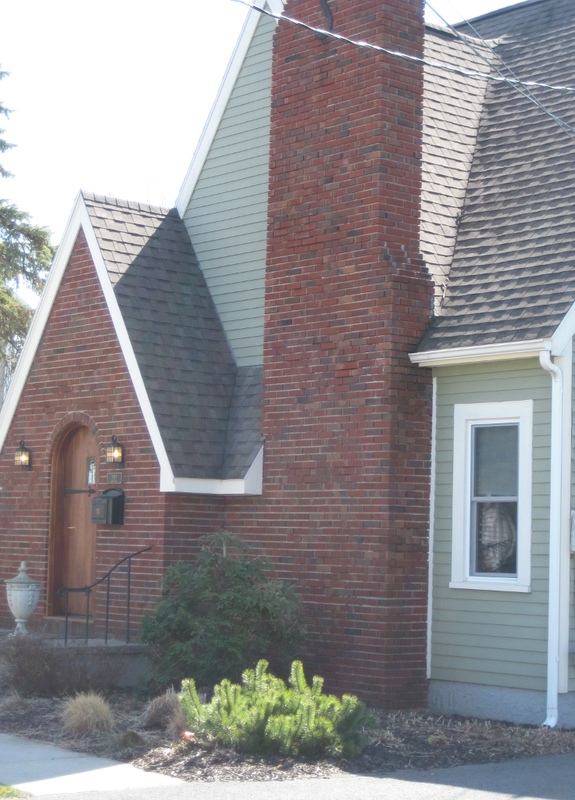 You are currently reading Brick Tudor Siding, Trim, and Roof Color at Your Home & Color Coach.